Last year Bloom brought a lot of support with them to 100MARIN and we are all back this year! We were so touched by the generosity of the members and the community we are here to stay as permanent members. A few weeks after our overwhelming win, the Northbay Firestorm took us all by surprise. Because of the resources provided by all of you, Bloom was able to respond immediately by bringing needed boxes of new undergarments, hygiene kits, clothing and even pajamas to the Marin shelter, initiated by Marin’s Center for Volunteer and Nonprofit Leadership. We mobilized our team of over 100 volunteers, and many others, to pack and transport boxes not only in Marin, but various other shelters in Napa and Sonoma. While this required us to deplete our inventory greatly, it was an easy decision to do so because we knew that funds from 100MARIN were there to replenish supplies for our regular clients. The most heartwarming moments during this time, and there were many, was the caravan of cars lined up, 22 long and wrapped around the block that arrived to Bloom within hours of our social media call for help. Our donors and volunteers happily shifted their priorities to ensure fire victims would have their immediate needs met, and 100MARIN fueled our ability to orchestrate such an effort. The word spread that Bloom was helping and many individuals called us directly and we were able to help get them back to work. Many victims were the working poor, living paycheck to paycheck, and needed work clothes immediately. Sharon, for example, lost every belonging in the fire, but couldn’t afford or risk missing her job of serving samples at a local store. She came to Bloom and not only received the reassurance she desperately needed, but plenty of black pants, white blouses, and comfortable shoes for her job. Sharon and other fire victims have since reported that jobs were kept, they’re making positive progress, and that Bloom was the pivotal reason they were able to move forward. We have many more accomplishments and works in progress to report, and I’m so delighted to now introduce Barrie to tell you all about them. Bloom is currently working on a partnership with Wells Fargo to provide interview skills workshops and financial literacy training to Bloom’s clients as well as several new community partners such as: Launch, College of Marin’s EOPS Program, and the CalWORKs program. Bloom is so excited about this new program these partnerships. We will launch the workshops soon and be able to dress all of the participants. Without the 100MARIN funds we would not be able to afford dressing the participants in the clothing they so vitally need to obtain and sustain employment. A portion of the funds from 100MARIN were used to add a second dressing room in Bloom’s women’s boutique, which has increased the capacity that we are able to take on client wise. We will be able to dress two women at a time especially when we hold group workshops. We were able to collaborate with several local organizations on a Mother’s day Project that truly touched all the staff. We were able to take care packages of jewelry, makeup, hygiene kits, and clothing into women’s shelters for mother’s day. Being able to make the day special for the women who are struggling with homelessness was a priceless experience for all of us. 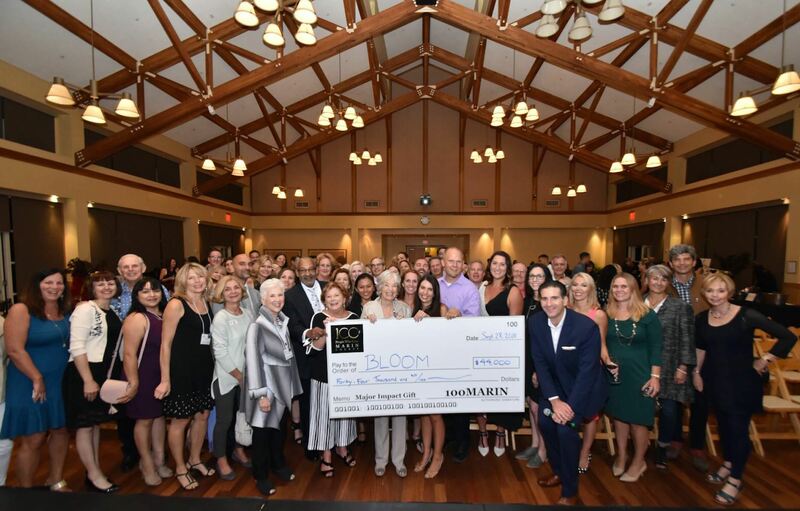 Because of 100MARIN Bloom was able to help your coworkers, neighbors, friends and those right here in Marin County that need a hand up and we truly thank all of you for that gift. We are pleased to announce our Fall 2017 Winner - Bloom. 100MARIN will be presenting Bloom with our collective gift of approximately $44,000! They are the only non-profit in the United States to provide wardrobes for the entire family at no fee to the client. Many thanks to our sponsors who helped make the evening a huge success. And, thank you to each and every one of our members for their ongoing commitment and support. San Rafael, CA, September 28th, 2016 –Marin’s premier giving circle, 100+ People Who Care: Marin County (100MARIN), shut down a block of A St. in downtown San Rafael on Wednesday, September 28th, from 6-8PM for the fourth of its fundraising events. 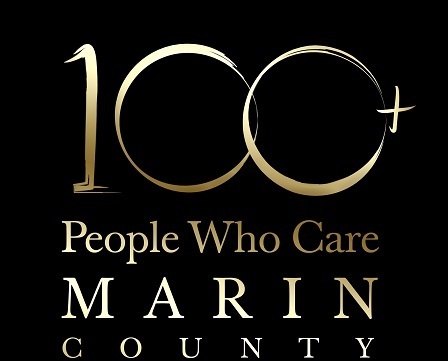 With over 300 attendees and 400 total givers, 100MARIN’s top award of $40,000 went to Marin City Health & Wellness Center, a program dedicated to health equality for African American communities. The event was hosted by CORE, a local group of business professionals, the members of which have a shared passion for Marin County and its non-profit community. The evening’s marquee sponsor was Michael Caldwell of the Caldwell Law Firm. The event’s format was as follows: 5 non-profit organizations each gave timed, 4-minute presentations during which they shared their mission, vision, need, and impact in Marin. All attendees were then asked to vote for their favorite presentation, at which point the votes were tallied, and Marin City Health & Wellness Center was announced as the winner. Since its inception in January 2015, 100MARIN has hosted four events that have collectively raised over $165,000 for 20 Marin-based nonprofits who improve our local community. The winning non-profit of the Spring 2016 event, Wednesday’s Gift, spoke prior to the presentations and shared with the audience the impact on their organization. As a result of winning 100 Marin, they utilized all $35K awarded for their programs to improve the community, and subsequently secured a matching grant for an additional $35K. The event was hosted al fresco, in the middle of A St., right out in front of Il Davide. Proprietor David Haydon catered the event, along with Jim Modesitt of Big Jim’s BBQ and Ted Razatos of Green Chili Kitchen. Wine sponsors included Duckhorn Vineyards, Rombauer Vineyards, Rodney Strong Vineyards, White Oak Winery, and Incavo Wine Lounge & Collective. For more information about 100MARIN or the most recent event please contact Jonathan Leidy 415.509.4668 or jonathan@porticowealth.com. Thank you 100 Marin! Nice to be here a little more relaxed than back in March. I was super nervous and really wanted to win. Now all I want is to express our tremendous gratitude to you all and let you all know the impact your gift has had in our/your community. In March 100Marin gave us $36,000. Since that time we have gifted $35,219.51 to individuals and families in need here in Marin County. Essentially 100 Marin put us on the map for local Marin County non-profits. As a result of the gift and the notoriety that came with it we have since received a matching gift of $35,000 as well as $20,000 from another donor and $5000 from another. Our reach is growing and that couldn’t have happened without you. Before our association with 100Marin our annual income was about $25,000 IF the Comedy Event went well and IF the Hoedown produced income. As a result of your gift we have had to tighten our processes, become more organized and efficient. We thank you for that. Before the gift we received about 5-6 requests per month. Since then that number grown to about 10 per week. Each request is vetted by a member of our gift committee. We hear their stories, listen to their need and grant gifts when appropriate. We take your gift very seriously and I promise you we are responsible stewards of the gift. So you gave us money. That is awesome. But I’ve been thinking about the real currency at play here and what I believe is, It Is Love. Last week a request came in from a couple we’ll call Mary and Joe. Due to some unfortunate circumstances their son had to give up his three children. 2,4 and 8. Mary and Joe had to step in and provide. They didn’t have beds, clothes or any other supplies a 2,4 and 8 year old would need. They heard about WG and Aileen went to the mobile home they live in to assess their situation. Within days we provided beds and gift cards to Target and Safeway. .
Now don’t get me wrong. They were grateful for the beds and gift cards. But they were also grateful for the loving way Aileen showed up and the speed with which their needs were met. So I believe LOVE propels the giving. In the last 6 months we have helped with rent, clothes, food, bedding. Because of our new visiblilty in the community we have partnered with other local no-profits. MCIL, Marin Community Clinic, Center for Domestic Peace to name a few. PG&E had become an important partner keeping power on. Your generosity/love has dramatically changed our ability to make a difference in the community we all live in. So thank you! Lastly, good luck to this years nominees. Try to relax and enjoy the moment! Congratulations to The Ceres Community Project for being selected as a nominee for the 100MARIN Fall 2016 Event! The Ceres Community Project creates health for people, communities and the planet through love, healing food and empowering the next generation. Supporting individuals dealing with serious illness with free, delivered and nutrient-rich prepared meals, nutrition education, and a community of caring. Involving young people as volunteer gardeners and chefs, giving them direct, hands-on experience of the difference that fresh, healthy foods and community make, and of their own capacity to contribute. Educating the broader community, including health professionals, about the connection between fresh, healthy food, strong social networks, healing and wellness. Connecting people of all ages and from all walks of life to one another, and to their value as an integral part of the community. Congratulations to Beyond Differences for being selected as a nominee for the 100MARIN Fall 2016 Event! Beyond Differences empowers students to end social isolation in middle school through online and campus programs. They are a student-led organization. They are the only organization singularly focused on ending social isolation. They grew out of the experience of a child. Lili Rachel Smith—the heart and guiding light of Beyond Differences—went through the pain of social isolation. They created Beyond Differences in Lili’s honor and memory. Congratulations to Marin City Health & Wellness Center for being selected as a nominee for the 100MARIN Fall 2016 Event! Marin City Health & Wellness Center provides services from San Rafael to San Francisco. Founded to provide affordable and accessible health care services to residents of public housing, they are uniquely located in the communities where their clients live. Congratulations to Enriching Lives through Music for being selected as a nominee for the 100MARIN Fall 2016 Event! Congratulations to The Marin Humane Society for being selected as a nominee for the 100MARIN Fall 2016 Event! We at Wednesday’s Gift would like to extend our sincere gratitude for nominating, and granting us the monetary gift of $35,000!!! The community recognition that we gained as a result of being a part of your wonderful group has been a springboard for us to do more work helping more people. This giving thing is very infectious! Many of us have already signed on to join 100MARIN as we personally witnessed the power of the giving circle concept. Again, a heartfelt thanks from all of us to all of you! !